How do I become a member of CCAC? What region am I in and how is that decided? Where are meetings held and when? What is League of California Cities? What percentage of City Clerks are elected? Where can I find more information about the Public Records Act? Where can I find more information about the Brown Act? Where can I find more information about the Political Reform Act? Where can I find more information about elections? Where can I find more information about the referendum/initiative process? What is the difference between a general law city and a charter city? What action requires more than a majority vote? What is the difference between a resolution and ordinance? What is Listserv, and how do I subscribe? What are the guidelines for posting on Listserv? Can anyone send an e-mail to the listserv or do you need to be a member? Who do I contact about placing a job announcement on the CCAC website? Does CCAC have an online store, or where can I purchase paraphernalia? What if I relocate to another city; does my CCAC membership stay with me? How do I apply for lifetime membership upon my retirement? What are the available training opportunities? What is Nuts & Bolts? What is the CEPO Leadership Institute? What is the annual conference and when is it held? What is the New Law and Election Seminar and when is it held? What is a Certified Municipal Clerk? What is a Master Municipal Clerk? How can I sign up for online education classes? How do I obtain a scholarship for training? How can I sign up to receive a mentor? Information on joining CCAC is available by clicking here. For any membership related questions, please contact CCAC Second Vice-President at [email protected]. Membership updates can be made through the For Members Only section. For any membership related questions, please contact CCAC Second Vice-President at [email protected]. All Primary Members and Associate Members have voting rights. Any Assistant or Deputy City Clerk whose City Clerk is a Primary Member, institutions and/or organizations whose operations are closely allied with the functions of the City Clerk’s Office, and professional persons in fields directly related to municipal government are eligible for Associate Membership. Stay tuned for updates on the new CCAC Regional Divisions! Regional meetings are held within the respective regions and notices are sent out with details. The annual CCAC conference is held throughout the state each April. The annual New Law and Election Seminar is typically rotated from the northern and southern part of the state each December. International Institute of Municipal Clerks. Founded in 1947, the International Institute of Municipal Clerks is the leading professional association serving the needs of Municipal Clerks, Secretaries, Treasurers and Recorders and other allied associations from cities and towns worldwide. IIMC’s primary goal is to actively promote the continuing education and professional development of Municipal Clerks through extensive education programs, certification, publications, networking, annual conferences, and research. As an educational catalyst, IIMC inspires Clerks to expand and advance beyond their present levels of development. IIMC also engages in municipal research administration, enhances critical professional skill development and fosters a spirit of mutual assistance and good fellowship among Municipal Clerks around the globe. IIMC administers the Certified Municipal Clerk and Master Municipal Clerk Programs. The League of California Cities is an association of California city officials who work together to enhance their knowledge and skills, exchange information, and combine resources so that they may influence policy decisions that affect cities. Founded in 1898 on the principles of local control and interagency cooperation, the League has grown from a handful of public officials to include the voluntary of 478 California cities. Today, the League and its member cities are working hard to strengthen the effectiveness of their advocacy efforts. The League's mission statement reflects this commitment to "restore and protect local control for cities through education and advocacy to enhance the quality of life for all Californians". If your city belongs to the League, you belong. Volunteer! Fill out and return a Volunteer Interest Form. Watch for requests for volunteers through the Listserv. Run for a position on the CCAC Board of Directors. The City Clerk is the local official for elections, local legislation, the Public Records Act, the Political Reform Act, and the Brown Act (open meeting laws). Before and after the City Council takes action, the City Clerk ensures that actions are in compliance with all federal, state and local statutes and regulations and that all actions are properly executed, recorded, and archived. The statutes of the State of California prescribe the basic functions and duties of the City Clerk, and the Government Code and Election Code provide precise and specific responsibilities and procedures to follow. The Office of the City Clerk is a service department within the municipal government upon which the City Council, all City departments, and the general public rely for information regarding the operations and legislative history of the City. The City Clerk serves as the liaison between the public and City Council and provides related municipal services. The Public Records Act is codified in Government Code Section 6250 et seq. The entire Government Code is available online at http://leginfo.legislature.ca.gov/. The Ralph M. Brown Act is codified in Government Code Section 54950 et seq. The entire Government Code is available online at http://leginfo.legislature.ca.gov/. The Political Reform Act is codified in Government Code Section 81000 et seq. The entire Government Code is available online at http://leginfo.legislature.ca.gov/. Additional information about the Political Reform Act can be found on the Fair Political Practices Commission (FPPC) website at www.fppc.ca.gov. The Elections Code is the primary source of information for elections held within the State of California. The entire Elections Code is available online at http://leginfo.legislature.ca.gov/. Additional information about elections can be found on the Secretary of State website at www.sos.ca.gov or by contacting your local Registrar of Voter’s Office. Note: If you are a charter city, your charter may have regulations that supercede the Elections Code. The Elections Code is the primary source of information for petitions, including referendums and initiatives. The pertinent information can be found in Elections Code Section 9000 et seq. The entire Elections Code is available online at http://leginfo.legislature.ca.gov/. Additional information about petitions may be obtained by contacting your local Registrar of Voter’s Office. General law cities are formed, organized, and operate pursuant to the powers provided by the Legislature as set forth in the statutes of the State of California, specifically the Government Code. Charter cities are created and operate pursuant to a charter or other similar document voted on by the citizenry. The primary difference between the two is that general law cities are subject to all constraints imposed by the Legislature with respect to local control, while charter cities maintain an additional level of autonomy over local affairs. A majority of the Council generally constitutes a quorum for the purposes of taking action. Most actions generally need a majority vote of the Council Members present for passage. However, some actions, such as urgency ordinances and resolutions of necessity, need a super-majority vote for passage. Notwithstanding the same, some cities may require a three-vote minimum procedurally. When in doubt, it is essential to check with the City Attorney’s office. Legislative action may be taken by either resolution or ordinance. The primary difference is that an ordinance effectuates a local law. A municipal code is comprised of ordinances and serves as a City’s constitution of sorts. A resolution is much less formal and generally addresses administrative and other similar types of matters. City Clerks should avoid posting inquiries on the City Clerks’ private Listserv on behalf of other city officials and departments. Instead, please use the League's “public” Listservs: http://www.cacities.org/listserv. Posting of job announcements (with the exception of Interim positions) are not allowed on the Listserv. Non-city officials, other than consultants or vendors, who wish to communicate electronically with City Clerks, may submit the message to the moderator of the Listserv. The Listserv is not available to consultants or vendors. However, the consultant or vendor may ask their member City client to post the message. The League does not sell or make available its lists of email addresses. The League’s Listservs are not to be used for commercial purposes. Subscribers are responsible for providing a summary of the responses they received to their Listserv question. It is important for members to share information; this is the fundamental purpose of the Listserv. When sending a summary, please identify the message as a “Summary” in the subject area. Also include the date, the source and the name of the person who conducted the survey. Please include the “original” question. Click here for the League's current Listserv policy. You have to be a subscriber to send a message on the City Clerk's Listserv. 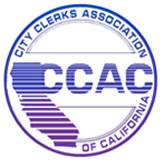 Your City has to be a member of the League of California Cities (LCC) or the individual has to be a member of the City Clerks Association of California (CCAC) to subscribe. To place a job announcement on the CCAC website, contact the CCAC Communications Director. CCAC merchandise is sold at the Annual Conference. Visit the CCAC store for more information. The Membership stays with the City. A CCAC member may become a lifetime member upon retirement if they have been a voting and/or associate member for a total of at least 10 years (at least 2 years of the 10 must have been as a voting member). In California, Clerks can take advantage of a multitude of training opportunities including programs at Region meetings,Technical Training for Clerks (TTC), Nuts & Bolts, CCAC Annual Conference, and New Law & Elections Seminar. IIMC also offers training opportunities in conjunction with its Annual Conference and through its distance education program. CCAC offers a two-day workshop called “Nuts & Bolts” to provide basic training and information on the basic responsibilities of the City Clerk’s office. Nuts & Bolts offers “hands-on,” informal training and provides firsthand and special attention to specific needs of individuals. This is an excellent training for those new to the Clerk’s profession or for those wanting a basic refresher. The seminar focuses on subjects such as agendas, minutes, record keeping, contracts, research methods, ordinances, resolutions and a myriad of other subjects. Participants receive information and training on proper procedures for conducting public meetings in compliance with the Brown Act and other legal requirements.The workshops occur annually with sessions held throughout California. As of September 2014, CEPO officially closed its doors. At its Board of Directors meeting held September 12, 2014, the leadership of Continuing Education for Public Officials Inc. (CEPO, Inc.) made the difficult decision to adopt the resolutions dissolving the non-profit organization and discontinuing training operations in its current form. This decision came after a great deal of deliberation and thoughtful reflection. Since 1973, CEPO has delivered educational opportunities to the public sector with its mission in mind - “transformation of individuals, organizations, and communities through leadership development.” CEPO Inc.’s mission has remained consistent. CEPO’s leadership is immensely proud of its presence in the world and the impact it has had on individuals and organizations. The tenets of CEPO’s teachings have reached communities throughout California and across the United States as well as internationally in the countries of Afghanistan, Tanzania, and Iraq. Additionally, CEPO is particularly proud of the inter-discipline community created by a wide variety of local government professionals joined by their common commitment to public service. CEPO is proud of what has been accomplished through its teachings and by its community and is thankful for its partners including the City Clerks Association of California, the California Clerk of the Board of Supervisors Association, the Municipal Management Associations of Northern California & Southern California, the International City / County Management Association, and the League of California Cities. The immeasurable relationships developed over the past forty-two years not only between CEPO and its member partners, but the personal relationships forged through time and experience will continue to exist. These many relationships in the form of strong friendships, collaborative support and public sector networking will continue to be valued by all of us. It has been an honor to be of service to the public sector and the entire CEPO community over the past four decades. The TTC, or Technical Training for Clerks, program consists of a series of four week-long sessions, held at the University of California Riverside Extension. The program provides indepth consideration of issues and skill enhancement with respect to the City Clerk profession and adheres to IIMC core curriculum requirements to maintain a balance of 50% technical, 30% interpersonal, and 20% elective courses. TTC sessions are held in March, June, and September on a continuing basis. TTC is an IIMC Institute for CMC, but will not count towards your MMC or recertification hours. The MMCA, or Master Municipal Clerk Academy, is the Advanced Institute for California. The Academy is designed and content is created with the more tenured and experienced municipal, county, and special district Clerk in mind. MMCA is specifically for those working on attaining the Master Municipal Clerk (MMC) or Certified Clerk of the Board of Supervisors designation. Certified Municipal Clerk (CMC) candidates will be accepted. The content is applicable and value-added for Clerks to the Board of Supervisors (County), Special District clerks, and City and Deputy Clerks. All gather with the common bond of a desire for lifelong learning, as these professionals continue to lead in their respective fields. What is the CCAC annual conference and when is it held? CCAC hosts an annual conference in April. The conference offers educational, professional, and networking opportunities for Clerks throughout the state. What is the New Law and Elections Seminar and when is it held? The League of California Cities hosts an annual New Law and Elections Seminar each December. This seminar focuses on newly enacted legislation pertaining to elections as well as sessions on other issues of interest to clerks. The conference location rotates between Northern and Southern California. The International Institute of Municipal Clerks (IIMC) offers a Certified Municipal Clerk (CMC) designation program to enhance the job performance of Clerks in municipalities of all sizes. A Clerk must attend extensive education programs, have relevant local government work experience and make professional contributions to earn the CMC designation. These requirements ensure that participants have developed the skills and knowledge necessary to meet the challenges of the complex role of the municipal clerk by providing them with quality education in partnership with 47 institutions of higher learning. IIMC has offered the CMC designation since 1970 and has helped thousands of clerks in various organizations. The International Institute of Municipal Clerks (IIMC) also offers a Master Municipal Clerk (MMC) program. Once a clerk has earned the CMC designation, s/he can then apply for entrance into the Master Municipal Clerk Academy (MMCA), which prepares candidates for reaching MMC status. The MMCA designation offers advanced continuing education programs to prepare participants to perform more complex municipal duties. The program has an extensive and rigorous educational component, a professional and social contribution component and a commitment to lifelong learning. Academy members must demonstrate that they have actively pursued educational and professional activities and have remained informed of current socio-political, cultural, and economic issues that affect local governments and municipalities. IIMC offers distance education opportunities. You can find details on this program at http://www.iimc.com. You can find detailed scholarship information on the CCAC website. TTC attendees must have a mentor, but anyone can have a mentor. Click here for more information on the CCAC Mentoring Program. Contact the Mentoring Program Chair for information on upcoming training sessions to become a mentor.